EXCLUSIVE! Soft and sophisticated in rayon viscose crepe. 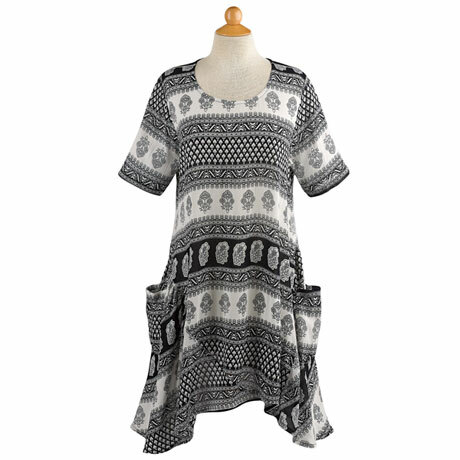 Short-sleeved tunic has a rounded neck, patch pockets, and pieced flared hem. The rhythmic designs are inspired by traditional block prints from India. Sizes S(6-8), M(10-12), L(12-14), XL(14-16), 1X(18-20), 2X(20-22), 3X(22-24). Size M hangs 32", longer on sides. Hand wash. Imported.